Make sure you like us on Facebook! That way you'll not only see when we publish blog posts, but also other fun videos and photos we share! For example, visit our page now to see a great video of a possible day outing for anyone going to the LDI Conference in Vegas this October - a zip line flight under the Freemont Street LED canopy! Now that Phase I is complete, we have begun the planning process for Phase 2 of the Burnside Park project! Phase 2 of the project will include a whimsical tree canopy lighting system that can be enjoyed by park-goers year round! Many parks utilize tree lighting for the holiday season, but Burnside will be unique in that the lighting design will be visible all year. 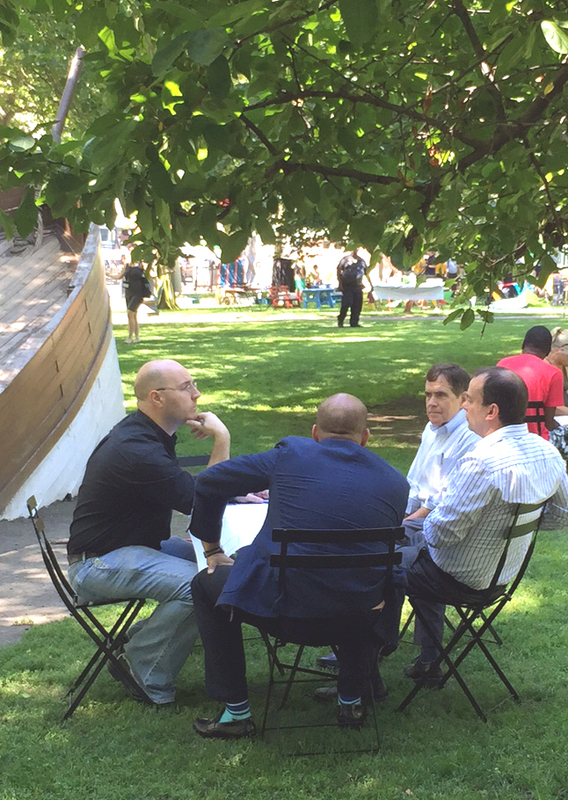 The intent of the new systems in Burnside Park in Downtown Providence will be to create visual interest and a sense of wonder as people travel in and around Kennedy Plaza and the park itself. This lighting will be visible from a distance, helping to draw attention to the park and increase its overall appeal relative to its surroundings. With the tree canopies glowing, the feel of the park will be one of soft illumination, improving the overall psychological impression one gets when walking around, in contrast to the harder urban impact of Kennedy Plaza itself. The Burnside Park installation will be a permanent addition to the look and feel of the park which would stand through the seasons and would have a different visual character based on time of year. The look of the lighting in summer with the branches full of leaves would be different from the look in the winter holiday season when the luminous objects would be clearly visible through bare branches. Stay tuned for more news and photos as the project moves forward! Burnside Park, Phase I complete! 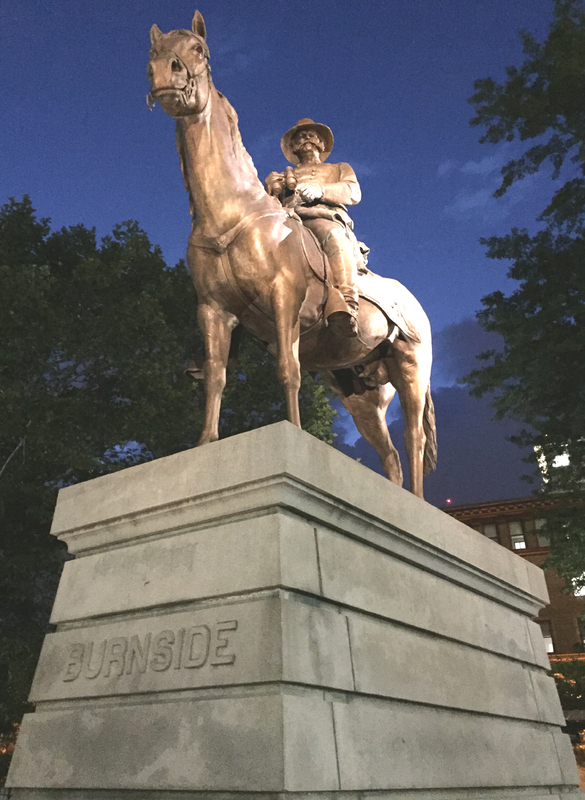 ALD recently had the opportunity to do final adjustment work on the gateway path and primary statue for Burnside Park in Providence, RI. The new lighting highlights the statue of Ambrose Burnside, the name sake of the Park and a Civil War general from Rhode Island, as he sits upon his horse. 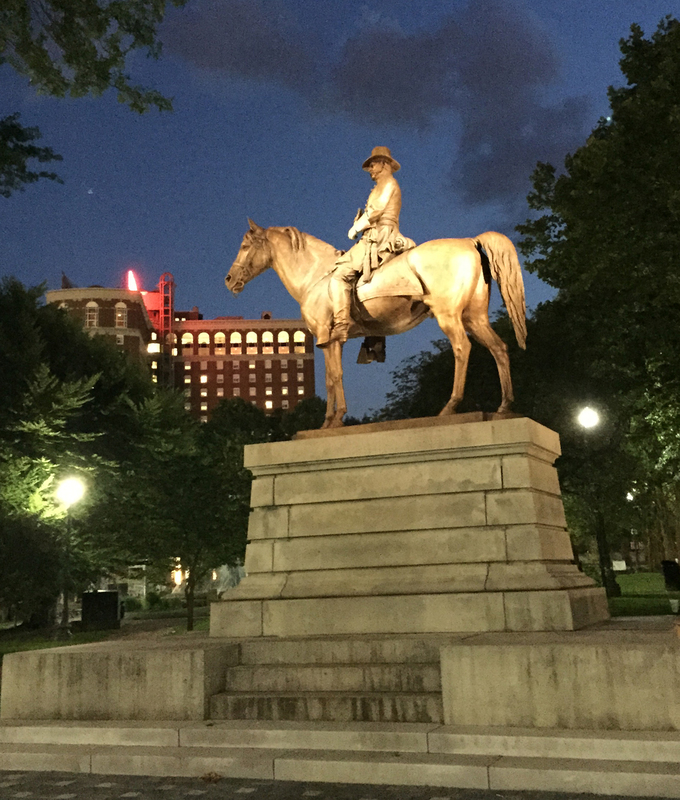 The impressive statue, which has just been completed cleaned, was completed in 1887 and installed at its current location right near Kennedy Plaza in downtown Providence in 1906.